CLOUDS BELONG TO 3 MAIN GROUPS DEPENDENT UPON WHAT HEIGHT ABOVE THE SURFACE THEY FORM. THE HIGHEST CLOUDS FORMING BETWEEN 30,000-40,000FT ARE CALLED 'CIRRUS' CLOUDS' WITH THOSE FORMING IN THE MIDDLE BAND OF THE ATMOSPHERE CALLED 'CUMULUS' CLOUDS AND THOSE NEAREST THE SURFACE ARE CALLED 'STRATUS' CLOUDS. WE'LL GO THROUGH ALL THE MAIN TYPES BELOW AND INCLUDE SOME OF THE SPECTACULAR WEATHER SOME CLOUDS CAN PRODUCE. CIRRUS This cloud is very common winter or summer and is usually a forerunner of deteriorating weather within the next 24 hours when seen drifting across from the West cloud is formed entirely of ice crystals high up in the atmosphere (sometimes as high as 40,000 feet). CONTRAILS These are a very common sight in the skies of Norton-Radstock. On the flight path to major London and European airports we often see these formed by freezing water vapour being extracted from aircraft 35,00 feet or so above the ground. They are often seen accompanying Cirrus clouds. CIRROSTRATUS This cloud is a forerunner of rain soon. Often seen here as a veil of milky cloud made up of ice crystals covering swathes of the sky it gradually thickens blotting out the sun and sometimes causing a halo effect around the sun or moon as shown above. ROLL CLOUD This cloud is often associated with showery weather. Formed by an upward moving current of air causing condensing of moisture on the front edge of an advancing shower it is often characterized by a sharp veer and increase of wind immediately preceding a shower of rain or hail. The streaks shown falling to the sea surface is precipitation which is often seen locally here in showery conditions. VIRGA In effect this is an Altocumulus Cloud. It is given this latin name from the fact that 'virga' is precipitation falling from the bottom of the cloud base. It meets a dry layer of air on its way down and evaporates long before reaching the surface. It is often seen in summer or winter when a change to showery weather is on the way. ALTOCUMULUS This is a more typical Autocumulus cloud associated with showery conditions. It is formed by convection in the middle part of the atmosphere and is a sky associated with unsettled and showery conditions. FAIRWEATHER CUMULUS These clouds are the most common cloud of all and can be seen on most days. As shown above they often form after a cloudless start to a day. They are made up of water vapour building upwards in the lower atmosphere during the warming temperatures of the morning forming individual pockets of water droplets floating across in the prevailing breeze before dissolving away again at sunset as the heat of the day cools. SHOWER CUMULUS These clouds are formed in the same way as 'fair weather cumulus' but grow much bigger in conjunction with an unstable atmosphere found in association with Low pressure. They are made up of dense water vapour from a strong updraught and are an indicator of showers of rain or snow mixed in with sparkling bright sunny spells. These can bet witnessed day and night at anytime of year when showery conditions prevail. This is the big Daddy of all clouds forming in deeply unstable air. It is called a CUMULONIMBUS CLOUD. They can be found at all times of year and are surprisingly quite common locally. They are always associated with very heavy showers of rain or snow. The clouds themselves are composed of dense water vapour in their lowest levels towering upwards to heights of up to 40,000 feet on occasion where the cloud turns to ice crystals and are the birth place of hailstones. Thunder and Lightning is common within this cloud with even tornadoes not out of the question. Local but large quantities of rainfall or snowfall in winter in a short space of time can occur from these clouds. MAMMA The below cloud structure is found on the passage of a retreating thunderstorm. It is formed by the up and down draughts within a Cumulonimbus Cloud caused by the powerful wind flows found near thunderstorms. It can be seen in Winter or Summer in very showery weather where gusty winds are prevalent. ALTOSTRATUS This is best described as a 'boring' cloud. It is a flat and featureless grey layer of mid level water vapour cloud which usually covers large areas of an observers skyscape. It gives the sky an opaque appearance. It can be seen in our local skies at any time of year and can give outbreaks of light rain or snow despite the sun still showing weakly through it. STRATUS This is another common cloud in all parts of the UK. It always forms when humidities near the surface are high. It is often seen in association with periods of rain and drizzle and the cloud may be low enough to shroud the tops of even modestly high hills and clifftops when its definition changes to hill or coastal fog. STRATOCUMULUS This cloud is composed of water droplets relatively low in the atmosphere. It is more common in winter when a warm layer of air covers colder air near the surface and can give us bright but cloudy weather but no precipitation. Occasionally seen on summer mornings it is more short-lived then as the seasonal heat from the sun is greater and breaks up the layers of air in the atmosphere disrupting the process needed for these clouds to form. MAN MADE CLOUDS This cloud is man made by the extraction of water vapour from cooling towers such as those at Avonmouth. Conditions need to be very quiet and calm for this to happen and any wind will render the chance of seeing this as useless. It is formed as the water vapour from the towers and chimneys rise in its parcel of warm air before cooling and condensing into Cumulus clouds over the source. It has even been known for these clouds to grow sufficiently large to allow ice crystals to fall in winter or drizzle to fall local to the source. I have seen this phenomenon in Autumn local to Radstock as stubble fires in early Autumn eject heat and pollution high into the atmosphere where in light wind conditions condensing takes place and cumulus clouds are formed. RAINBOW Probably one of the most majestic and beautiful weather phenomenon to be seen. These phenomenon are formed by the refraction of sunlight passing through millions of raindrops falling from a shower cloud. The arc is in fact a circle which can be witnessed from an aircraft. The best time to view a rainbow is early morning or late evening as the arc of the bow will extend high up in the sky directly opposite the sun. A secondary bow (above)can often be viewed on the outside of the main bow with the normal red, orange, yellow, green, blue, indigo and violet colour sequence reversed. 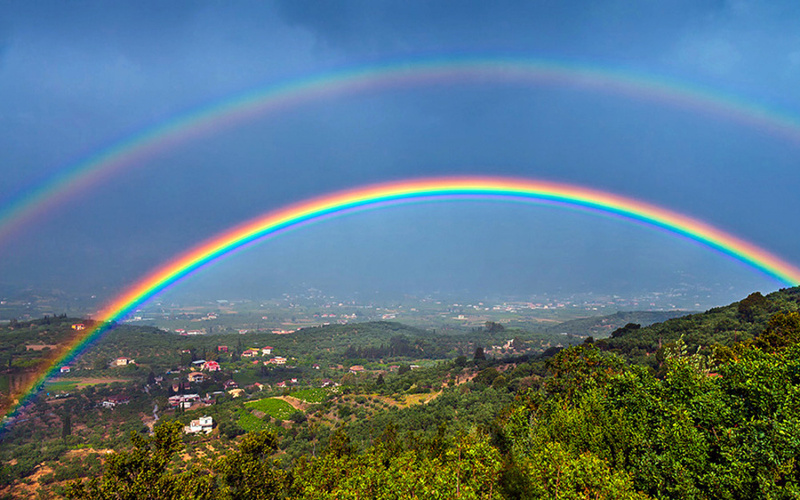 A rainbow can also be seen rarely from a full moon as a colourless white bow only (no colour) as the moon is reflected light of the sun and contains no refracted UV light. WATERSPOUT You won't see one of these in Radstock or Midsomer Norton. A waterspout is a small tornado out to sea sucking up water in a rapidly spiralling cyclone of air. They are generally harmless and last only a short length of time before dissolving away. LIGHTNING In Midsomer Norton and Radstock there are on average 12 storms per year but we have fallen well short of this in recent times. It develops within Cumulonimbus clouds and is fuelled in summer by very warm and humid air following a hot spell and in winter by the warm seas around our coasts pushing well formed storms from over the sea inland. It is thought lightning is created by the rubbing together of positive and negative elements in up and down draughts in a Cumulonimbus cloud aided by hail formation. In summer the lightning can be frequent with thousands of flashes from one storm (many invisible from the ground by day). In winter there are far fewer flashes from any one storm but in winter cloud levels are lower allowing winter lightning being more dangerous as it tends to strike cloud to ground more than cloud to cloud. The result from lightning is thunder of course and the closer the lightning the louder the thunder. It can be heard from a maximum distance of approximately 12 miles. The lightning's distance can be calculated in miles by counting at second intervals, i.e.the difference in seeing the lightning and the first sound of the resulting thunder then dividing by 5. TORNADOES Unlikely but not impossible here these can be potentially powerful beasts which can have a central core of winds in excess of 200mph though thankfully not that severe in the UK. They are formed over large land areas such as the States where temperature extremes are large over a short area of land giving rise to powerful thunderstorms and rotating columns of air. Believe it or not the UK has more tornadoes than anywhere else in Europe. Many are weak and go unreported, going undetected at night or on open land, sea or in un-populated areas. Wide scale damage from these systems is fortunately rare in the UK. RADIATION FOG It is most common in late Autumn and early Winter when it can persist all day in places. This is formed by the cooling of ground after sunset by thermal radiation in calm conditions under clear skies. The cool ground produces condensation in the nearby air. In perfect calm conditions fog can be just a thin layer near the surface supporting the visibility of the top of higher objects and not the bottom. ADVECTION FOG This formed by moist air moving over a cold surface by prevailing winds. It is often observed over higher ground when warm moist air is forced over the up-slopes where it cools and condenses forming fog. It is quite common over the Mendips when a warm moist SW flow passes over the hilltops often in rainy spells. COASTAL FOG This is most often witnessed on hot days in summer where cool air over waters off the coast move inland on sea breezes and comes into contact with the warm land where it condenses over cliff tops and shore lines creating fog. It evaporates away quickly often just a few 100 metres inland from the shore line as it encounters the warmer air inland. FREEZING FOG This occurs when fog is super cooled to air temperatures below 0C where the tiny droplets in fog freeze to all surfaces forming 'rime' build up on trees and hedgerows which look like snow as they build up over time. In extremely cold winter nights It can be sufficiently thick on occasion to fill the sky with tiny ice crystals similar to very light snow depositing a thin layer on all surfaces replicating light snowfall. SNOW In Winter when the weather becomes cold enough our normal rainfall becomes snowfall. Formed by the complex mixing of air below 0C with water vapour a snowflake is born. The complex structure of the process of creating these makes it virtually impossible to find two identical snowflakes. In recent years our area has been spared major disruption from snow events but it is the one topic of weather that most people are interested in more than any other and creates much excitement and hype from our youngsters and media alike. Sometimes when the temperature is borderline for snowfall a combination of rain and snow falling together can be witnessed. This is called sleet. Snow can fall in our area anytime from late November to late April but rarely lasts for more than a few days before the inevitable thaw sets in. HAIL As noted in the Cumulonimbus Cloud text Hail forms in a Cumulonimbus thundercloud by a process of repeated updraughts carrying rain droplets high up in the cloud where they freeze and fall back down through, before meeting the updraught again and going up once more. This process of up and down can occur many times before the weight of the stone supercedes the power of the updraught making it fall down through the updraught and cloudbase to the ground. In essence the bigger the updraught the bigger the hailstone. It is usual for the biggest hailstones to fall in summer around large thunderstorms following a hot spell when they can be large enough to cause damage to vegetation and infrastructure in places. In winter they can be softer (soft hail) but cover the ground quickly in short sharp showers. Hail can be witnessed at anytime of the year in our area.